What is the central purpose of the church today? How can churches experience renewal through worship? In Gathered before God, Jane Rogers Vann answers these important questions by studying ten vibrant small, medium, and large churches. Her findings, she argues, show that worship is the most important thing churches do and is crucial to the renewal of congregational life. Vann explores how these congregations changed into worship-centered churches and how their experiences can help other churches do the same. Gathered before God offers resources for pastors, worship leaders, and Christian educators to reflect on their worship, leading to an openness to change and processes to help church leaders support each other during the periods of reform and renewal. Moving beyond the "contemporary versus traditional debate," Gathered before God is an earnest call for us all to reclaim worship as a central act of our life together as Christians that expresses clearly what the church believes about God, itself, and the world. Interpretation(Vol. 59, No. 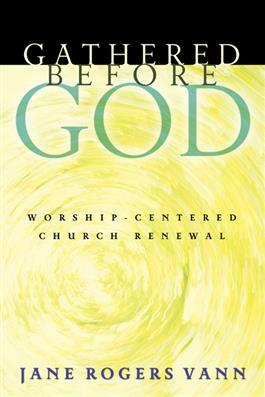 4, October 2005)"Pastors who share Vann's passion for the centrality of worship will find in this book food for the journey, and those who don't might well find cause for repentance." The Conrad Grebel Review(Vol. 23, No. 2, Spring 2005)"One of the book's strongest attributes is the balance given to art and academics, educationand theology, theory and narrative. It is also unique in its ability to talk to Protestants aboutritual while cautioning against ritualization, toaddress moral formation without being moralistic,and to address mission without using worshipmechanistically."